WAIST HIGH: Shrooms. Hot Lava. Really Evil People. The Pacific Northwest Is A Hotbed Of Goings On. Shrooms. Hot Lava. Really Evil People. The Pacific Northwest Is A Hotbed Of Goings On. (katu.com) "Seven Washington County (Oregon) residents are expected to survive after eating poisonous mushrooms. The group was hospitalized after picking the mushrooms near their home. 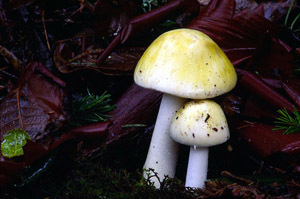 Death Cap Mushrooms grow in abundance in the Northwest and can be confused with popular non poisonous varieties."